I picked up the book Physics of the Future: How Science Will Shape Human Destiny and Our Daily Lives by the Year 2100 mainly to see what is in store for humanity in the year 2100. Having read Ray Kurzweil’s 3 books on a similar subject, this was of interest to me. When people predict the future they usually underestimate the pace of progress, just imagine when you looked at CPUs between 1980 and 1985, you would never think that we would have quadcore CPUs in our laptops, these quadcore CPUs would outperform those clunky machines by such a factor that it is almost impossible to put it on the same graph. Optogenetics is the combination of genetics and optics to control well-defined events within specific cells of living tissue. It includes the discovery and insertion into cells of genes that confer light responsiveness; it also includes the associated technologies for delivering light deep into organisms as complex as freely moving mammals, for targeting light-sensitivity to cells of interest, and for assessing specific readouts, or effects, of this optical control. What about having retinal display contact lenses? These lenses would connect directly to the internet. I guess it would be fine for certain things but for most things it would be a big distraction. The book also mentions driverless cars, of course Google already showed that after the book was published so this is only a matter of time. Will the robots take over is explored in this book, the singularity is also discussed. In terms of medicine, nanobots that go through our veins and zap cancerous cells will be here, your doctor might be a robot. Clothing will be smart, if you get injured, your clothes will make a diagnose of your condition and together with your gps location they will send a signal to the nearest hospital. All in all, I found this book very interesting and very entertaining. for some people all these thing will be scary and they will be scared of it, for other people it will be exciting and they will embrace these changes. 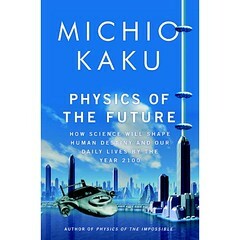 Michio Kaku has already seen some of these inventions already as proto types being tested right now. You don’t need to be a science buff to understand this book, it is dumb down to appeal to the masses.